THE FIRST SCIENTOLOGY IDEAL ORGANISATION (Org) in Switzerland’s dazzling history opened its doors to a grateful public on Saturday in an historic and dignitary-studded dedication ceremony in the picturesque Swiss city of Basel. THE NEWEST IDEAL CHURCH OF SCIENTOLOGY OPENED ITS DOORS with a grand opening ceremony on April 25. Scientologists from cantons across the country were joined in celebration by those from France, Germany and Italy. “Your Founder, L. Ron Hubbard, once prophesied that ‘On the day when we can fully trust each other, there will be peace on Earth.’ Today, for the people of Basel, and as stated in that magnificent booklet by your Founder, the Burgfelderstrasse has become ‘The Way to Happiness’.”–Mr. Robert Mesey, Federal Justice of Switzerland, Ret. BASEL’S NEW IDEAL ORG stands on the city’s Burgfelderstrasse mere blocks from the Swiss-French Border in the district of Great Basel-West. The 45,000-square-foot facility is quintessentially Swiss-Modern in style. Just minutes from the city centre, it will provide Scientology services and a common meeting ground in the tri-country corner. 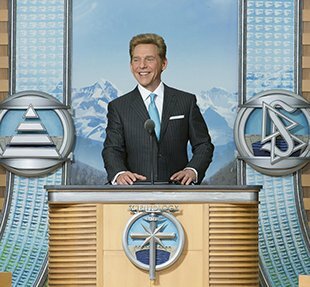 The Church of Scientology Basel welcomes anyone wishing to obtain an introduction to Dianetics and Scientology. The Public Information Centre presents more than 500 films, providing a complete introduction to every aspect of Dianetics and Scientology—including the beliefs and practices of the religion and an array of Church-sponsored humanitarian and social betterment programmes. THE BASEL CAFÉ welcomes visitors touring the Church or attending the many scheduled events. It is further provided for parishioners during breaks in their Scientology services. THE GARDEN TERRACE, adjoining the café, serves as a seasonal meeting ground in the spirit of an Ideal Organisation. It is a home for Scientologists and the greater community alike. The Church features course rooms designated for introductory services including a wide array of Scientology Life Improvement Courses to help better any aspect of one’s life. AMONG THE MANY INTRODUCTORY SERVICES available are evening and weekend Dianetics and Scientology seminars, imparting an overview of fundamental principles and their application in everyday living. L. Ron Hubbard developed the Purification Programme to free individuals from the mental and spiritual damage caused by drugs and toxins, through a regimen of exercise, sauna and nutrition—all of which are provided for in the Purification Centre. In the Hubbard Guidance Centre, Scientologists participate in auditing (spiritual counselling). Beyond this waiting area are rows of auditing rooms to meet the needs of Basel’s expanding congregation. SCIENTOLOGY AUDITING (spiritual counselling) is delivered in an array of auditing rooms, each of which provides a quiet, distraction-free environment necessary to achieve spiritual enlightenment. In the Academy, Scientologists train to become auditors (spiritual counsellors), capable of applying the technology of auditing to help others attain spiritual freedom. The Basel Academy comprises multiple course rooms, each devoted to a different aspect of training. As is traditional in all Churches of Scientology, the Office of L. Ron Hubbard stands in honour of the religion’s Founder and symbolises that this Church is true to his writings and ideals. Switzerland is a nation long renowned for its exquisite craftsmanship of everything from watches to pocketknives and culinary delicacies that remain the envy of the world. And consistent with that uncompromising emphasis on quality, the first Scientology Ideal Organisation (Org) in that European nation’s dazzling history opened its doors to a grateful public on Saturday in an historic and dignitary-studded dedication ceremony in the picturesque Swiss city of Basel. The newest Ideal Church of Scientology resides at the knee of the Rhine River in the tri-national region bordering France and Germany along with Switzerland. For the grand opening celebration on April 25, Scientologists from cantons across the country were joined by those from France, Germany and Italy. Basel’s new Ideal Org stands on the city’s Burgfelderstrasse mere blocks from the Swiss-French Border in the district of Great Basel-West. The 50,000-square-foot facility is quintessentially Swiss-Modern in style. Just minutes from the city centre, it will provide Scientology services and a common meeting ground in the tri-country corner. The opening serves to continue forward the momentum generated by the religion’s explosive international growth, with the proliferation of Ideal Churches on every continent leading the immense expansion over the past decade. Joining the Scientology parishioners and Church officials on Saturday were luminaries representing all levels of the Swiss cultural landscape. They included Robert Mesey, Federal Justice of Switzerland, Ret. ; Dr. Johann Bauer, Author and Professor; and finally, Ayhan Seker, Vice President, Basel Muslim Commission. Basel’s new Ideal Org provides all visitors with an introduction to Dianetics and Scientology, beginning with the Public Information Centre. Its displays, containing more than 500 films, present the beliefs and practices of the Scientology religion and the life and legacy of Founder L. Ron Hubbard. The Information Centre also offers a detailed overview of the many Church-sponsored humanitarian programmes. These include a worldwide human rights education initiative; a far-reaching drug education, prevention and rehabilitation programme; a global network of literacy and learning centres; and the Scientology Volunteer Ministers programme, now representing the world’s largest independent relief force. The Centre is open throughout the day and evening for visitors to tour at their leisure and return as often as they wish. Basel’s Ideal Org also features a chapel that provides for Scientology congregational gatherings, including Sunday services, weddings and naming ceremonies as well as a host of communitywide events open to members of all denominations. The Church further includes multiple seminar rooms and classrooms, in addition to an entire floor dedicated to Scientology auditing (spiritual counselling).